This is a delicious option to have for a prepare ahead dinner party. The crust on the fish works wonderfully and will be a welcome addition to the dining table. Place the hake fillets onto a flat baking tray lined with parchment paper. In a large bowl combine the breadcrumbs, chopped herbs, lemon zest, grated parmesan and melted butter and mix well. Divide the herb topping between the four fillets. Place the fish in the oven and cook for 18-20 minutes until cooked and the herb crust is crisp. Meanwhile make the lemon butter very simply by mixing together the melted butter, chopped herbs, capers and lemon juice. Keep the butter in a warm place until the fish is cooked and then drizzle all over the herb crust. One of the best fish dishes ever. We’ve made it for dinner parties, and family meals etc and everyone loves it, you can get it ready in advance, a huge bonus. Flavours are delicious and the lemon vinaigrette gorgeous. What an amazing yet so simple recipe. I was complemented on it being restaurant quality. Fabulous recipe, I added garlic powder to the breadcrumb mix and was very pleased with it. I'll definitely do this one again. Absolutely gorgeous, so tasty and quick to do. Deliciously tasty & beautifully simple recipes. All my family love it! This was so good and very quick and easy to make. I would use it again. Many thanks for this recipe. The flavours are remarkable, and the crust browned perfectly. So easy to make and so little time to prepare and bake. I made this tonight for dinner....it is absolutely delicious. 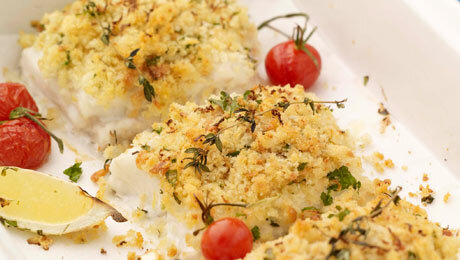 The breadcrumbs with lemon zest and parmesan really made the hake pop with flavours. Excellent recipe for Hake.,the butter sauce delicious, thank you Kevin. This is a great delicious basic recipe for any type of firm fish. My daughter who is learning how to cook had this ready when I came home. It tasted like more. We will definitely make it again. Another success by Kevin Dundon!